From the author of the successful blog, mouthwateringvegan.com, comes over 130 incredible recipes to showcase how accessible, varied, delicious and nutritious vegan eating can be. 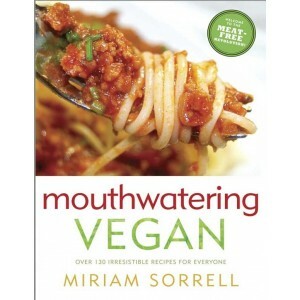 In this book you'll find recipes for your favourite comfort foods in all their vegan glory. Here are meat-free, egg-free and dairy-free recipes that combine the idea of eating healthily, with food that is immediately satisfying, tastes great and is easy to prepare. From delicious dips, appetizers and soups; to main courses including curries, pastas, stews, burgers and salads. There are a whole host of recommended juices and smoothies and--at the sweeter end of scale--cookies, cakes and desserts. Mouthwatering Vegan transforms home cooking classics into vegan-accessible, delicious dishes. Miriam challenges herself to replicate dishes that are usually impossible to include in a vegan diet and opens up the scope for what vegan eating can be. Included in the book are recipes for vegan cheese, cream and mayonnaise; Chilli Con 'Carne', Shepherd's Pie, Mince & Ale Pie, Stroganoff Supreme and the Perfect Roast. As well as delicious dishes that celebrate pulses and vegetables, such as Aubergine, Chickpea and Potato Curry; Stuffed Tomatoes and Zucchini Casserole; Red Bean Nut Burgers; Spicy Rice & Quinoa Eggplant Bake; and Super Mushroom & Walnut Loaf. Many of Miriam's recipes are inspired by the Mediterranean and the Far East, and all of them have the health benefits of vegan cooking without sacrificing the taste. Mouthwatering Vegan opens up new possibilities for vegan eating that will make you rethink vegan cuisine.